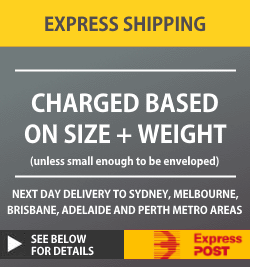 Shipping costs are based and size and weight of your parcel. Where possible, we will envelope your order to minimise costs. Please allow about 3-8 business days for delivery, depending on where you are in Australia. For Northern Territory and non-metro Western Australian customers, please allow up to two weeks for delivery. Need your order quicker? Select Express Post when you check out. 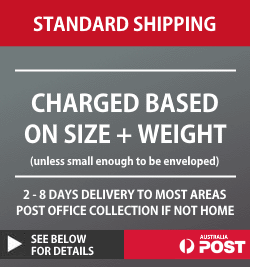 Order before 2PM AEST on a business day to get overnight delivery to the Australia Post Express Post network. Click here to see if you're in this network. For the rest of Australia, your order will usually arrive within two working days. 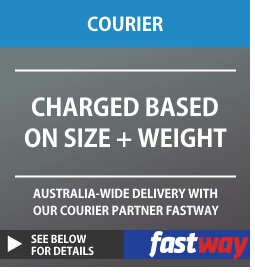 We've partnered with Fastway Couriers to offer you fast, safe and reliable delivery to just about anywhere in Australia. Depending on where you are, we can usually offer you a range of international shipping options. We strongly recommend you select an option that includes tracking, where available. International shipping usually takes about 10-14 working days but any option you choose that includes tracking does arrive sooner. International orders may be subject to local charges. Any customs or import duties and associated fees are charged once the parcel reaches its destination country. These charges must be paid by the recipient of the parcel. The Bridge Shop has no control over these charges and cannot predict what they may be. We cannot be held responsible for any local charges on your order. Customs policies vary widely from country to country, so please contact your local customs office for more information. 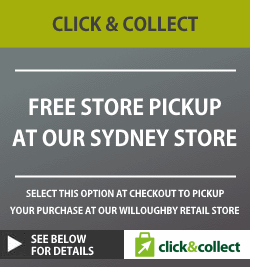 Select the Click & Collect option at checkout to collect your purchase from our retail store at 182 Penshurst Street Willoughby, New South Wales (map). If placing your order between 9:00am and 2:00pm on a weekday, please give us two hours to pick and pack your purchase and have it ready for you to collect. If you place your order after 2:00pm on a weekday, on a weekend or a public holiday, we'll have your order ready for collection from 11:00am on the next business day. It's OK to change your mind. We understand that it's sometimes hard to make a purchase without actually touching and seeing a product, so that's why we offer you a 30-day 'no-quibbles' money back policy. Please note however, that this offer does not apply to purchases of software and other digital products. We love to hear from you! We want to answer your questions, give you advice and hear exactly what you thought of your experience with us. Email: Our email form here. When? : Monday to Friday 9:00am to 4:00pm. We are based in Sydney and closed on public holidays.